This is located within the General F. Thomas Riley Wilderness Park in Coto de Caza, California within Orange County. 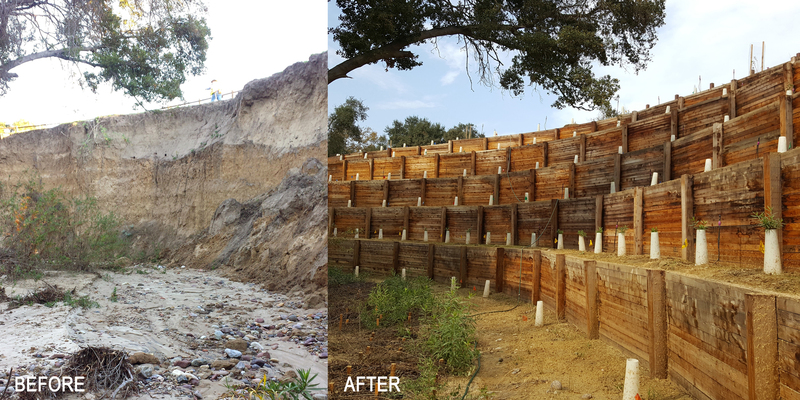 This project was led by Civil Engineers but with many technical disciplines and regulatory and funding agencies also involved to collectively solve severe erosion problems within General Thomas F. Riley Wilderness Park along the Wagon Wheel Creek in Coto de Caza (two miles long). The erosion problems were contributed to by both in-stream flows and lateral runoff flows from years of development within the watershed. The project objective was initially focused on erosion control and later extended to water quality management and habitat and native plant enhancement and mitigation. The conflicting needs of engineering stabilization to stop the overwhelming erosion issues versus compatibility with the nature park setting and environmental regulations are the main challenges of the project. In addition, the creek moves around quickly, the topographic data change frequently, and the technical analysis and design work must be updated to address these changes. Historically, the project area has provided a unique natural setting for mature oaks, a small meandering creek (Wagon Wheel Creek), and a wildlife corridor. Severe bank erosion and channel degradation resulting from urban-runoff impacts due to years of land and transportation developments within the small watershed have created a significant threat to public streets and utilities, OC Parks facilities, mature trees, and the overall ecology within the wildlife park. A unique and holistic approach was developed to strategically provide engineering measures in areas of limited disturbance in order to provide critical erosion-control to prevent catastrophic failure due to the progression of headcutting. The project design by WRC Consulting Services, Inc., included engineering measures coupled with bioengineering protection and habitat and native planting to naturally restore the creek’s health, increase habitat diversity, encourage the growth of native plant communities, and reduce urban runoff pollution via bio-detention and bio-filtration. To establish the design basis, a comprehensive, multiple-phase and multi-objective planning effort was applied taking into account the watershed area, floodplain boundaries, channel, pipes, facilities, roadways, trails, soils, geology, hydrogeology, water quality and biology. Special analytical methods and unique design features were developed to ensure that the recommendations are compatible with the environments and settings of the nature park, and that the stabilization measures are sustainable against the erosive forces of future storms, given their acceptance by and the cooperation of the relevant regulatory agencies. WRC’s diligent efforts at finding the best practical solutions to stabilize Wagon Wheel Creek and restore the environmental value of the nature park helped the project receive funding support from OCTA and obtain timely permits because of early collaboration with the U.S. Army Corps of Engineers, the San Diego Regional Water Quality Control Board, the U.S. Fish & Wildlife Service, and the California Department of Fish and Wildlife. The project was performed in the following four phases over a five-year period; the construction started in 2016 and was completed in the late fall of 2017, and post-construction monitoring is continuing. Phase I: Field Evaluation, Survey Coordination, Concept Design and Feasibility Studies including Hydrology, Hydraulics, Geomorphology, Soils, Geology, Ecology, Water Quality, and Landscaping, Operation and Maintenance Guidelines, and Grant Funding Assistance. Phase II: Flood, Erosion Control and Water Quality Improvement Design including H&H Modeling and Analysis, Design Alternatives, Engineering Calculations, and Detailed Design and Performance Evaluation for Wagon Wheel Creek under the Project Conditions. Phase III: Mitigation Plan Development, Permitting Assistance, Value Engineering, Plans, Specifications and Estimates (PS&E), as well as Bid Preparation, Assistance, Analysis, and Award. Phase IV: Field Modifications and Construction Support. The construction components include six areas with unique design features. These project features for erosion control in Area 1, Area 8, and Area 9 include terraced redwood walls (referred to as Timber Walls) and sheet pile grade control combined with rock channels and energy dissipaters. These are creative but practical solutions to balance engineering stabilization needs with the wildness park environment. These offer not only creek restoration but water quality benefits for the downstream receiving water bodies: the Gobernadora Groundwater Basin, the San Juan Creek, and the Pacific Ocean. The project also created an earthen berm in Area 11, converting the natural creek storage to an in-stream water quality basin for runoff retention. The earthen berm was also purposely built to induce backwater overtopping of the east bank and replenishing the subsurface water in the historical floodplain in which the riparian plants had been degraded. Mitigation planting was also installed as part of the project. This project applied unique approaches and design methods that were not taught in the classroom nor seen in day-to-day design practices. The project involved stream erosion through headcut processes in Wagon Wheel Creek, which is underlain with non-cohesive soils, patches of gravel, and significant subsurface water (the worst kind of all, as severe erosion can occur even during minor flows). The erosion process resulting from years of urban runoff converted the small parkland shallow swale to a deepened creek, and in some areas there was a steep 35-foot-tall wall, referred to herein as the “Grand Canyon Wall” (see Feature Photo). Prior to construction, the Grand Canyon Wall was about to collapse, interrupting traffic on Oso Parkway, a school route along the pedestrian bridge and the bridle path, and use of the trail and park. It is extremely challenging to design a solid engineering solution to prevent the consequences of collapse of the 35-foot-high deep canyon wall, considering the restrictions posed by funding limits, materials used in the nature park, encroachment on designated Waters of the U.S., natural resources protection, and regulatory permitting challenges. The wall can be stabilized with many common geotechnical measures, but not in the creek itself without major cut-and-fill and disturbance to Waters of the U.S. or to the park facilities and Oso Parkway. The wall cannot be restored using a soft approach, given the meandering of the creek and its profile management using the “restoration techniques” cited in many bioengineering design and habitat-restoration publications. This is a real-world problem, but funding and regulatory permitting further restrict the potential solutions. In addition to the pre-project Grand Canyon Wall, the potential for the creek to aggravate this overwhelming erosion problem has existed in many other reaches due to concern over continuing headcut erosion coupled with uncontrolled lateral runoff that may deepen and widen the erosive stream. The typical flood-control and erosion-control measures with hard engineering are not applicable due to the length of the creek, the limited funding possibilities, and the need for park/environmental compatibility. Under the supervision of OC Parks, WRC Consulting Services, Inc., developed a unique approach that is creative, aesthetic, and environmentally friendly but was engineered to be stable and with solid hydraulic and erosion/sedimentation analysis for creek stabilization. The project design was based on the principle of encouraging the creek to “heal itself” but with a strategic plan to minimize the disturbance and “anchor” the most critical areas vulnerable to headcut erosion. Specific to this project, the erosion-control methods considered the short- and long-term erosion potentials from both directions of the flows: the in-stream channel flows and the lateral runoff dropping down the creek bank during frequent or large storm events. The final erosion-control solutions which we brought in to address the pre-project conditions as stated previously represented the BEST MANAGEMENT PRACTICES (BMPs) to provide “anchors” in Areas 1, 8 and 9 in order to prevent continuous headcut erosion from progressing upstream and the bank-sloughing process from progressing eastward, which was threatening the trail and park as well as Oso Parkway street, drains, and utilities. To prevent creek-deepening (and consequent widening), a series of sheet piles coupled with a rock/stone channel and energy-dissipation measures was placed along the critical erosion-control areas. The sheet pile design depth was optimized taking into account the presence of gravel and the associated deepening costs. The rock/stone channels were to protect sheet piles and provide for transition from the upstream undisturbed creek to the downstream natural stream. The sheet pile was buried in the creek bottom in order not to interfere with flows, sediment transport, and wildlife traffic. The small drops (each less than two feet) formed by oversized derrick stones along the rock/stone channel and the downstream pools were designed to dissipate high flow velocities through the historical major channel drop area (more than ten feet of drop through Area 9, with the most significant drop occurring near the Area 8 and 9 boundary, where the pool is located). Sheet pile driving machines and techniques were selected based on reducing ground disturbance and noise impacts. The sheet pile alignments were designed and field-adjusted to reduce impacts on mature trees (especially mature oak trees). The channel profiles, sections, and rock and stone dimensions were determined based on in-depth hydraulic and erosion analyses and reduction-of-fill requirements. Restoration of the sloughed high steep bank in Area 8 (“Grand Canyon Wall”) was implemented via “Timber Walls” wherein a series of terraced walls with redwood panels and posts was constructed within the eroded area. The five-foot-high posts in each terrace were stabilized with concrete foundation, and layers of geogrid fabric were applied to fortify the compacted lower depth of soils to achieve a higher degree of stability. Part of all these solutions involved having nature “heal on its own” facilitated by the habitat and native planting and seeding provided throughout project construction areas as well as by natural colonization. The large stormwater filtration system under the Area 7/8 Bioswale served to collect storm runoff from the densely developed housing, school and ballfield areas east of Oso Parkway. The Area 11 Earthen Berm aesthetically blended itself into the woody meandering creek and will enhance natural creek storage as runoff-retention for low flows and high-flow diversion to the historical floodplain. These are creative but practical solutions that attempt to balance engineering stabilization needs with the preservation of a wildness park environment. The project offered not only creek restoration but water quality benefits for downstream receiving water bodies: the Gobernadora Groundwater Basin, San Juan Creek, and the Pacific Ocean. To earn the OCTA’s grant funding and to win the trust of the relevant regulatory agencies, OC Parks hosted a series of office and field meetings through the planning and design phases. WRC Consulting Services shared with each participating member the technical background of the watershed and creek systems, the unique geomorphology and erosion features of the creek, the potential conflicts in applying traditional engineering or restoration measures, and the specific design methods and measures applicable to the achievement of the erosion-control and restoration objectives. The participating members devoted their time and interest towards helping the project attain funding and permitting. The project construction was completed in the late fall of 2017, with plant establishment monitoring to be extended as required by the Habitat Mitigation Plans. Through a rigorous planning process for goal-setting, scoping, and approach definition, a concept plan for each priority area was derived by WRC Consulting Services, Inc., which addressed the concerns of stakeholders including OC Parks, OCTA, OC Public Works, the Santa Margarita Water District, homeowners associations, the US Army Corps of Engineers (for designated U.S. Waters), and other regulatory agencies. The erosion magnitude in some areas such as Area 8 had formed an overwhelming “grand canyon”-like deep and wide gully with a 35-foot steep wall with non-cohesive materials and the presence of subsurface water. Many talents among the WRC team members and OC Parks have been drawn upon to develop alternatives and seek solutions that can satisfy the special conditions of this project. The final solutions we brought in for implementation to address the pre-project conditions represented the best management practices (BMPs) to provide “anchors” to prevent continuous headcut erosion progressing upstream in several reaches (Area 1, Area 8, and Area 9) and the bank-sloughing process eastward threatening losses and damage to the trail, the park, and even Oso Parkway and its storm drains and utility lines. Part of the solution was for nature to “heal on its own” with the habitat and native planting and seeding provided through project construction as well as through natural colonization. A large stormwater filtration system under a nicely vegetated shallow bioswale (the Area 7/8 Bioswale) served to collect storm runoff from densely developed housing, school and ballfield areas east of Oso Parkway. In-stream biodetention and recharge through the historical floodplain by the flood peak overtopping the creek bank was offered by the Area 11 earthen berm. These project components were designed to resolve conflicting objectives such as structural stability for flood and erosion control versus preservation of the natural setting for park users, wildlife and ecology. - Typical bioengineering and restoration measures would not function due to the magnitude of the losses and damages and the speedy progress of the headcut process. - Water supply-need options from the Santa Margarita District. - Highly erosive soils and subsurface flows. - Gravel layers restricting deep sheet pile application and requiring a unique design to combine sheet pile with stone and rock for armor protection as well as energy dissipation. - A need for opportunities for habitat and water quality enrichment. - OCTA Funding Opportunities and Requirements. - Rights of way within the OC Parks boundaries. - Working within designated Waters of the U.S. would create major restrictions to the design and construction. - The dense tree canopy would impose limitations on plant establishment due to sunlight blockage. - The protection of mature trees would require field modification and close construction monitoring. - Working within the creek during the winter season would cause frequent construction interruptions. - The need to avoid impacting nearby homes. - The Project would be under long-term, close monitoring to comply with the Habitat Mitigation Monitoring Plan. To earn the OCTA’s grant funding and win the trust of the regulatory agencies, OC Parks hosted a series of office and field meetings through the planning and design phases. WRC Consulting Services, Inc., shared with each participating member the technical background on the watershed and creek systems and the fundamental difference of the geomorphology and the erosion and sediment features when compared to other streams, as well as the principles of the design and mitigation calculations. The participating members became highly interested in and involved with our project, which helped achieve our funding award and pass the permitting process, as they understood the significance of restoring the creek and the challenges we faced that limited the application of traditional environmental restoration measures. - 2013 NACPRO (National Association of County Park and Recreation Officials) Award for Environmental/Conservation. The significant erosion problems of the Wagon Wheel Creek could not be solved with traditional measures. A unique approach was developed which led to funding, permit approval and completion of construction. This success was based on the principal to help the creek to “heal itself” but with a strategic plan to minimize disturbance and anchor the most critical areas vulnerable to erosion. The creative solutions were backed up with solid engineering calculations and detailed design. This project involves the restoration of a two mile long reach of Wagon Wheel Creek within the General Thomas Riley Wilderness Park in Coto de Caza, California. Historically, the park provided a unique natural setting for mature oaks, a shallow swale and a wildlife corridor. Severe creek bank erosion and channel degradation resulting from urban runoff created a significant threat to public streets, utilities, facilities, mature woodland, and park ecology. The erosion magnitude was overwhelming, particularly in Area 8; a “Grand Canyon Wall” was formed along the 35 feet high, 100 feet wide gully, which was expected to collapse eastward and threaten Oso Parkway. Under the contracts with OC Parks, special analytical methods and unique design features were developed by WRC Consulting Services, Inc. to address the conflicting needs of engineering stabilization, to stop the severe erosion, and the compatibility of the natural park setting and stringent environmental regulations. The engineering measures were coupled with bioengineering protection and habitat and native planting to naturally restore the creek’s health and reduce urban runoff pollutions with bio-detention and bio-filtration. The final erosion control solutions included installing a series of buried sheet piles coupled with rock/stone channel and energy dissipation measures, where the pre-project condition involved significant drops and extreme erosion hazards such as in Areas 1 and 9. To prevent continuous sloughing of the “Grand Canyon Wall”, a series of terraced walls with redwood panels and posts was constructed within the eroded area and fortified with compacted fill and geogrid fabric sheets. A large storm water filtration system under the Area 7/8 Bioswale served to collect the storm runoff from the densely developed housing, school, and ballfield areas east of the Oso Parkway. Hydraulic diversion structures were provided to safely by-pass the high flows. The Area 11 Earthen Berm aesthetically blended itself into the woody area to enhance the natural creek retention of the irrigated runoff and to provide high flow diversion to the historical floodplain.